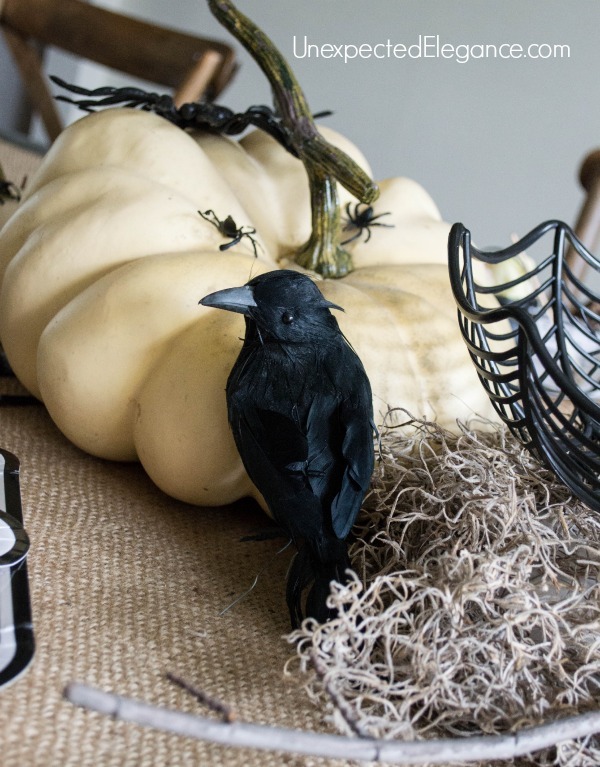 If you haven’t thought about Halloween decor yet, then you are not alone. My kids have been asking to put up ours for weeks but I like to wait until a week before. It’s one of those holidays that isn’t my favorite so I put it off as long as I can…and I try to make it as easy as possible. 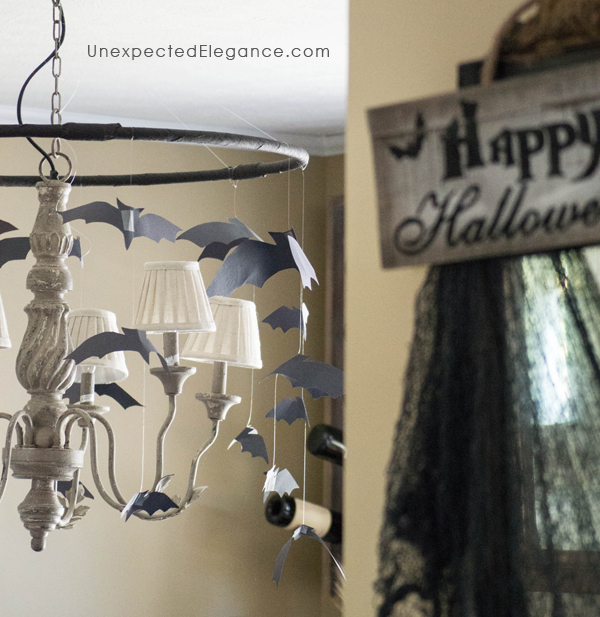 Honestly, I would probably just skip over the Halloween decor, if weren’t for my kiddos. We are more about the creepy look, as opposed to the scary. 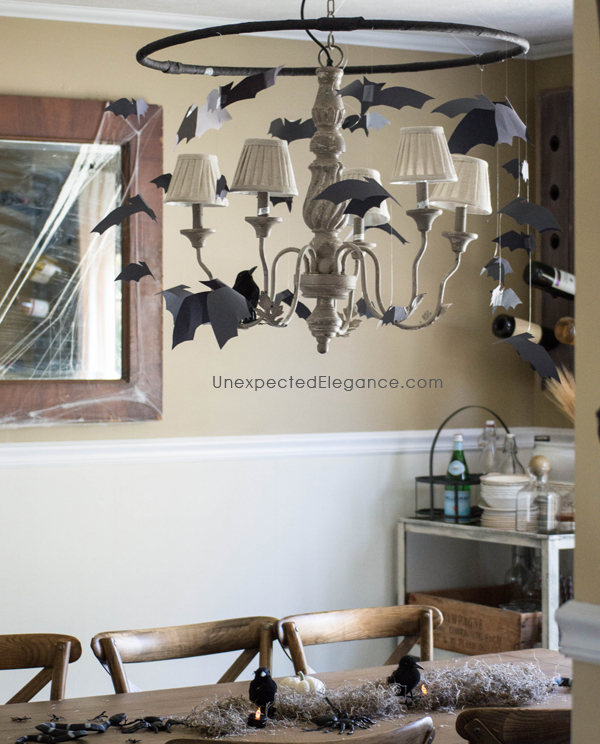 So this year I made a “bat mobile” for our dining room. 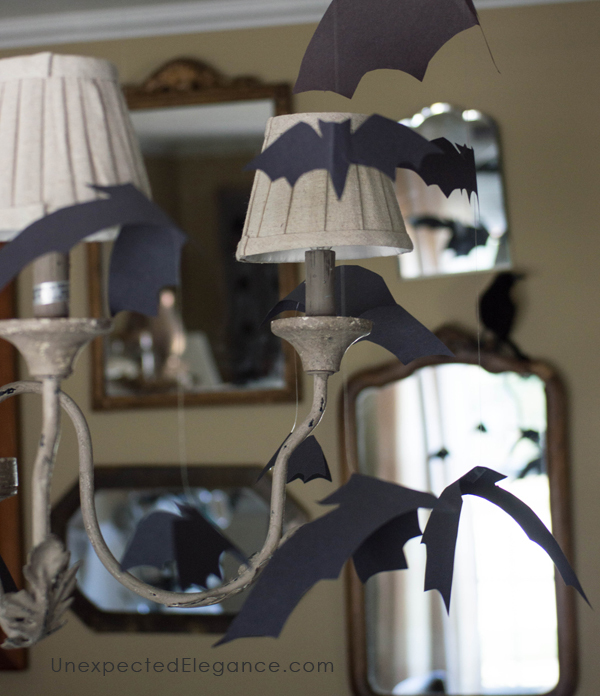 At night with candles it gives the effect of flying bats. If you tap it, the bats will move for a while! Fortunately, we had all the supplies for this but I think you can find everything you need at the dollar store. 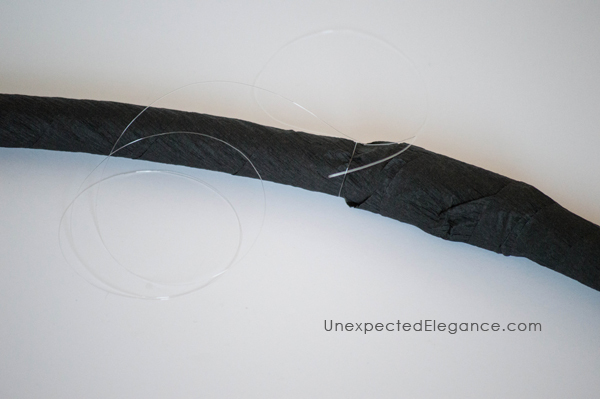 Start by wrapping the hula hoop with the black crepe paper and tape off the end. 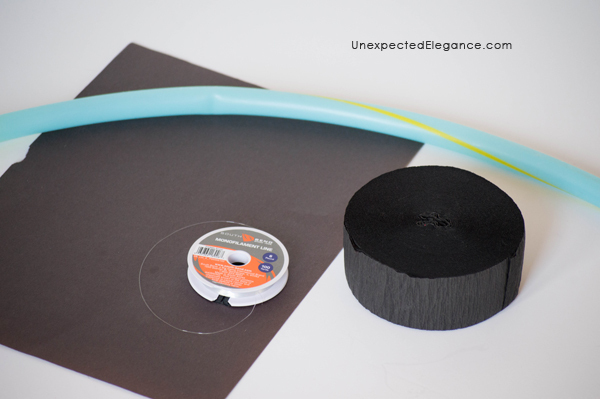 Then tie a few pieces of fishing line, equally spaced, around the hoop. 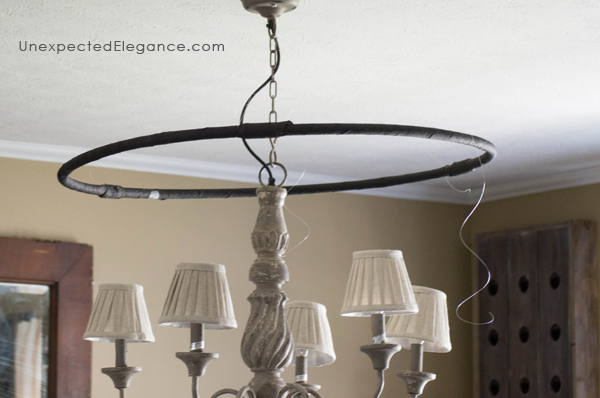 Be sure to leave enough length to attach the string to the ceiling or chandelier. Hang the hola hoop from your ceiling. I tied the fishing string directly to my chandelier but you could also use tacks. 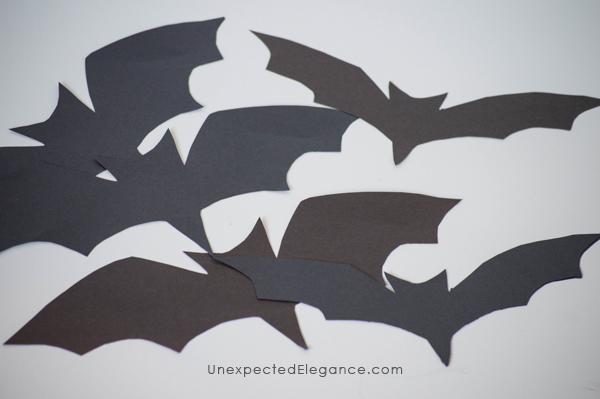 Cut out different size bats from the black construction paper. You can either just free hand them or get a template: HERE. 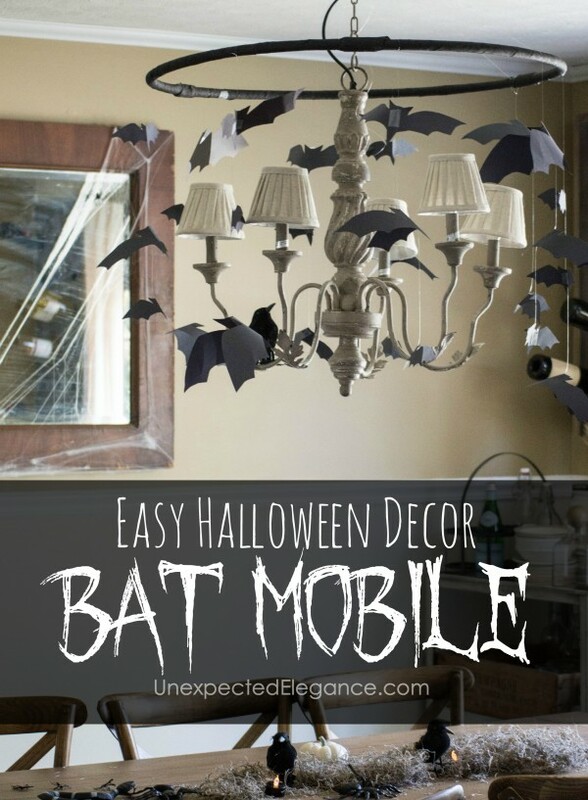 Then tape the bats to long pieces of fishing string and hang them from the hula hoop. 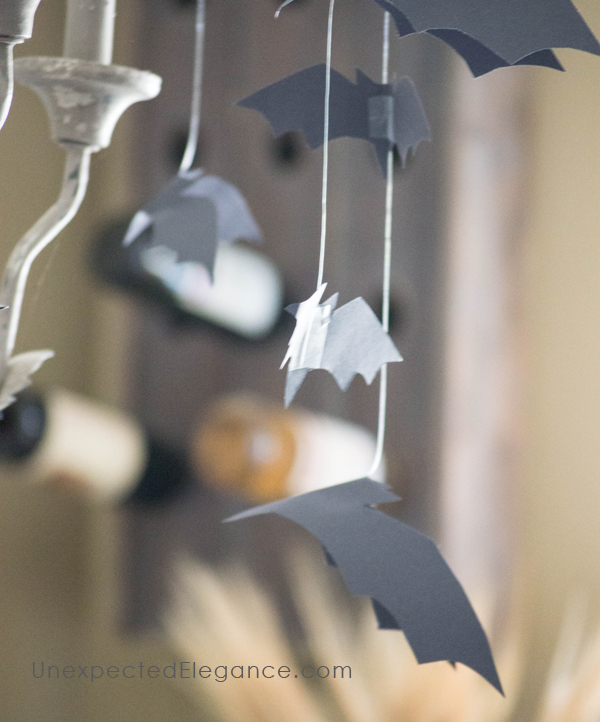 For more easy and inexpensive Halloween decorating ideas, check out this POST. la realidad es que de esta manera pasa. Cada que leo tus artículos encuentro algo nuevo. Te juro que llevo no menos de tres horas leyendo cada entre las cosas que has escrito y me semejan geniales. se da el momento, podamos conocernos. Saludos!